Get pro-level training at home. Ritmo oscillating feet and 1200 watts of resistance simulate a grade up to 10% combine to deliver an authentic road feel. Race the 2 video courses included or create your own with the RealVideo smartphone app. The training software matches it with imported GPS data to recreate any route’s altimetry. Stay motivated by racing up to 7 real or virtual rivals. The only things missing are wind in your face and a yellow jersey. Software automatically adjusts magnetic resistance according to speed, weight, and gradient, simulating slopes up to 10%. Add any ANT+ chest strap to run Conconi tests and determine your maximum anaerobic and aerobic threshold heart rates. After testing your current abilities, the Real software recommends a personalized 4-week plan for improvement. Wireless bar-mounted console for mid-ride adjustments has 3-LED status indicator (takes 2 AAA batteries). 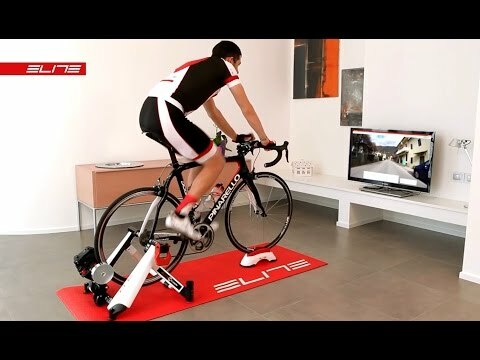 Functions without a computer as a stand-alone trainer with multiple resistance levels.